UK, 1972, 99 minutes, Colour. Laurence Naismith, Diana Dors, James Villiers, David Lodge, Lynne Frederick, Dorothy Alison, Rosalyn Lander, Marc Granger. The Amazing Mr Blunden is a family film directed by Lionel Jeffries from his screenplay of a novel 'The Ghosts' by Antonio Barber. It is an engaging period piece: two periods - 1918 and 1818. The film focuses on children who time-travel. 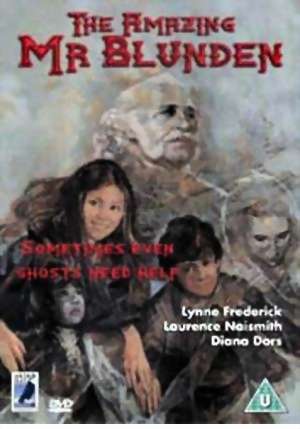 Laurence Naismith is the pleasant ghost Mr Blunden. There is an interesting gallery of characters ranging from Dorothy Alison's pleasant Mrs. Allen to Diana Dors' evil Mrs. Wickens and James Villiers' Uncle Bertie. The film has the atmosphere of Edwardian children's stories as well as the Dickens touch. 1. An entertaining family film ? Periods? Time travel? Ghosts? The effect for children, parents? 2. The world of 1918, dingy London, Langley Park, the atmosphere of the early 18th century - decor, costumes, wealth? The colour photography and sunny daylight, sinister dark sequences? Special effects and magic? Ghosts? Musical score? 3. The focus on Mr Blunden? Laurence Naismith as a genial ghost? His appearance in 1918, his kindliness, the visit with Mrs. Allen, his proposal about Langley Park? His helping the family? His attachment to the children? His reappearance in 1818? The children realising he was a ghost? His help, rescue? The ghost who puts things in order? 4. James and Lucy, 1918, their widowed mother, living in London? The visit of Mr Blunden and its effect? The visit to Langley Park? Into the cottage? The children at play, the encounter with Sarah and Georgie? The potion? Jamie and Lucy going back to 1818? The encounters with Uncle Bertie? Mr and Mrs Wickens? The friendship with Bella? The problems of marriage, the inheritance, the Wickenses and their evil plotting? Their using Bella? The various methods to disinherit the children? Setting the house on fire? The friendship with Tom, his place as a servant, his joining the children, helping with putting out the fire? The rescue of the children? Their return to their own time? Their looking at their own time and Langley park with the eyes of the past? The graves? Sarah and Georgie as their ancestors? Their inheriting Langley Park? 5. Mrs Allen and her plight, love for her children, Mr Blunden, Langley Park, settling in, coping with the children? 6. Sarah and Georgie and the past, children, resembling Jamie and Lucy, play, the friendship with Tom? Wandering Langley Park? The Wickenses and their dastardly deeds? The plots? Their using Bella? With Uncle Bertie? The fire? 7. Uncle Bertie and his wealth, sinister, cruel? 8. Bella and her lacking wits, being used by the Wickenses? Friendship with the children? 9. The realm of history and fantasy? The 19th century - reality, ghosts? The atmosphere of family cruelty, greed? Aristocracy and servants? The change to the 20th century? Equality? The new world? 10. An enjoyable set of imaginative adventures? Issues that concern children? Good and evil? Right and wrong? of good?